A larger capacity model of the original Citation, the Cessna Citation II sees improvements in fuselage, powerful engines, a larger fuel tank, and increased baggage capacities. 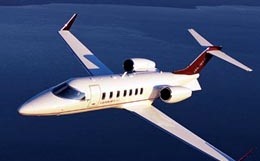 Most importantly, the Citation II features drastic upgrades in range, equipped to travel 1520 sm. The Cessna Citation II was first introduced in 1977 as the second iteration of the Citation line. When compared to its predecessor, the Citation II featured a longer fuselage, increased baggage capacity, upgraded engines, increased fuel capacity, and an increased wing span. 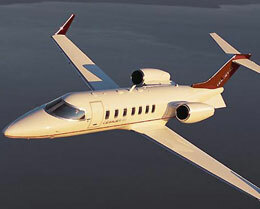 With the release of the Citation II, Cessna both defied the current trends of the private jet market and set the standards for light short-to-medium range jets to come. 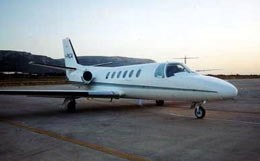 Production on the Citation II started in 1977 and ended in 1996. 729 aircraft have been built so far. The Citation II offers a variety of cabin arrangements with six, eight, and ten passenger configurations being most prominent. The extended cabin reaches 16 feet in length, measures 4.9 feet in width, and stretches 4.8 feet in height. Twelve windows surround the cabin, allowing for natural lighting and a stunning view. The Citation II is more than capable of accommodating your luggage, providing 47 cubic feet of baggage capacity. The Citation II features a high aspect ratio wing design with an increased wingspan, allowing for improved aerodynamic performance. The engines of the Citation II are located farther aft, rendering the cabin of this private business jet quieter than that of its predecessor. The Citation II comes equipped with two Pratt and Whitney JT15D-4 turbofan engines. These engines are rated for 2,500 pounds of thrust each with an inspection interval of 3,500 hours. The Citation II needs only 3,450 feet of runway to take off and requires only 2,078 feet of runway to land on a standard day. 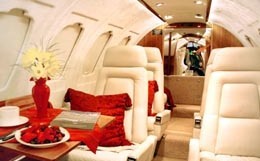 The Cessna Citation II is certified with a maximum service ceiling of 43,000 feet, well above most aviation traffic. This private business jet is capable of maintaining its 376 knot high speed cruise velocity at an altitude of 35,000 feet. For longer trips, the Cessna Citation II can fly at its long range cruise speed of 307 knots at its maximum all engine service ceiling of 41,000 feet. The Citation II features a climb rate of just over 3,000 feet per minute and a range of 1,739 nautical miles. This private business jet keeps the short runway capabilities of its predecessor, allowing you access to airfields previously unavailable to aircraft in this class. The Citation II generally comes standard with modern digital avionics. Some of the instruments typically found in the avionics suite include a Sperry Primus 400 weather radar, ADF 60s, dual Collins TDR 90 transponders, dual Sperry SPZ 500 5″ flight directors and SPZ 500 autopilot, King KLN 90B GPS, Sperry AA 215 radar altimeter, dual Collins VHF 20A comm radios, VIR 30A navs, and DME 40s. In conjunction with the advanced instrumentation, the Citation II flight deck features 340 degrees of visibility, allowing for easier navigation. Due to the simple controls, the Citation II can be configured for single pilot operation, decreasing operating costs while increasing flight planning flexibility. For more information about chartering, leasing or buying a Citation II please contact us by calling +44-20-3874-8091 or send us an email here.